So wrote fashion designer Christian Dior in The Little Dictionary of Fashion: A Guide to Dress Sense for Every Woman, first published in 1954. The shy, retiring Frenchman whose haute couture creations were inspired by memories of his mother may have been famous for dressing the well-to-do, but his straight-talking approach to fashion was definitely down to earth. Any woman could be elegant without spending much money on her wardrobe, as long as she chose simple, tasteful pieces that suited her personality, flattered her, and emphasized her good features. Dior in Ohio: 1947-1997, the current exhibition from The Ohio State University’s Historic Costume & Textiles Collection, presents Dior-designed ball gowns, daywear and suits that were worn either by Ohio women or are from the collections of Ohio museums. The upstairs gallery features clothing and accessories from the early years of the House of Dior, as well as examples of designs from Dior’s assistant, Yves St. Laurent, who, at age 21, succeeded Dior after his sudden death in 1957. Several items in the exhibit belonged to Elizabeth Parke Firestone (1897-1990), whose husband, Harvey Firestone, Jr., ran the Firestone Tire and Rubber Company in Akron, Ohio. 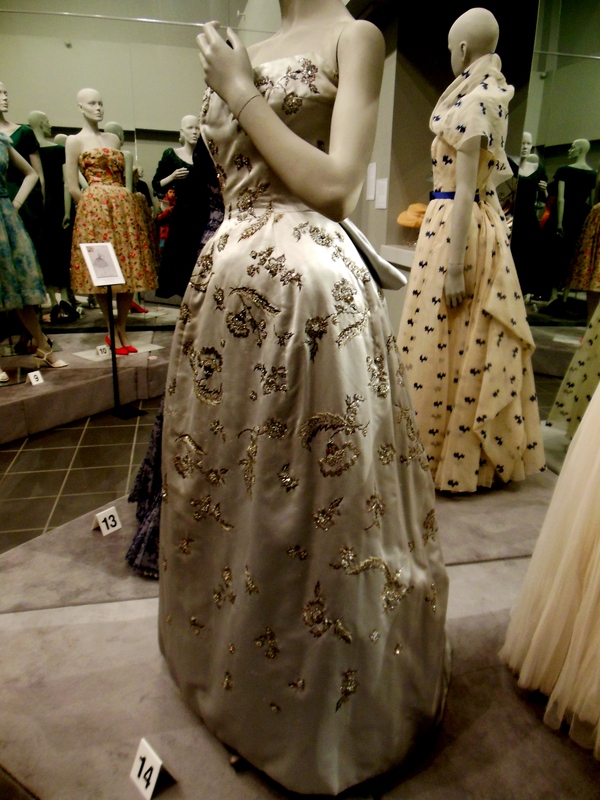 For example, this beaded satin gown Mrs. Firestone wore in 1955 to the re-opening of the Vienna Opera House is similar to one she wore to President Eisenhower’s inauguration in 1953. Mrs. Firestone would often purchase several versions of the same dress in different hues and prints. She wore the navy silk-and-wool tailored day dress with polka dot motif and blue chiffon trim at the neck — at the center of this trio — during a trip to England for the 1953 coronation of Elizabeth II. She also owned navy versions of the two day dresses flanking it. Two of Mrs. Firestone’s Dior creations have been turned inside out to display the layers of linings and hand-finished details that define a haute couture dress. Every Dior dress is marked with ink that is only visible in ultraviolet light. To make his designs more affordable for his American clientele, Dior created his Christian Dior-New York line. 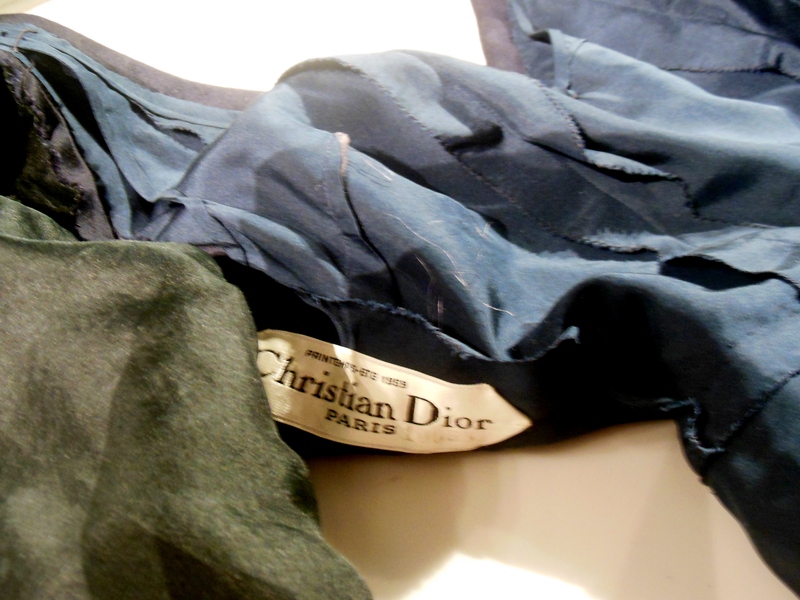 Garments in this line with an “Original” label were exact reproductions of Dior’s original Paris designs, including the actual fabrics, but were made in the United States. Only 120 retailers were allowed to carry the Dior-New York label; Ohio stores included Lazarus in Columbus, J. M. Gidding & Co. in Cincinnati and Halle Brothers in Cleveland. 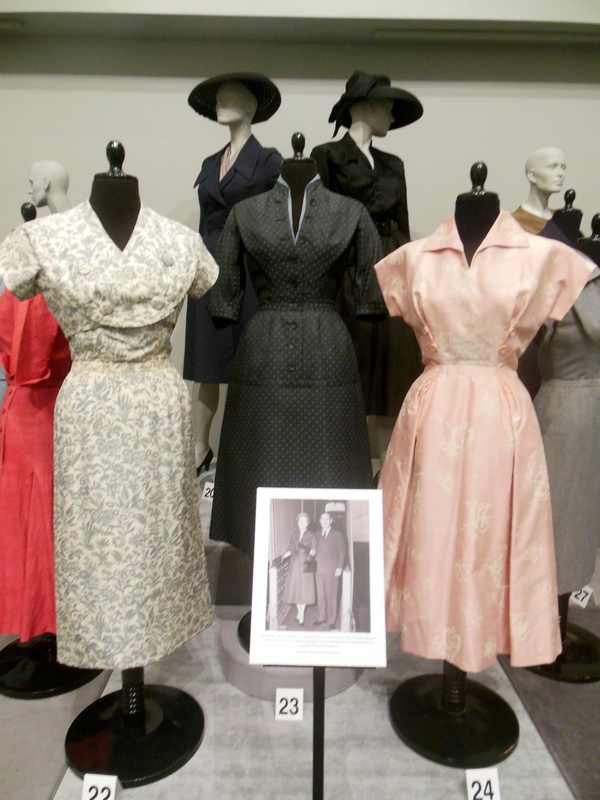 The exhibition also includes Dior garments owned and worn by Dorothy Bell Peters of Lancaster, Ohio (whose husband was the last owner of the Reese-Peters House, now the Decorative Arts Center of Ohio) and her daughter, Mary Peters Bolton, whose husband was special assistant to the U.S. Ambassador to France from 1949 to 1952. Other garments belonged to Marilyn Maxwell, who modeled in New York before marrying Stewart Shillito Maxwell, whose family owned Shillito’s, the first department store in Cincinnati, and Julie Loeffell, who modeled for Dior himself in Paris. The downstairs gallery features eveningwear created by designers following Dior and St. Laurent, as well as examples of the “little black dresses” that Dior considered the most essential piece in any woman’s wardrobe. 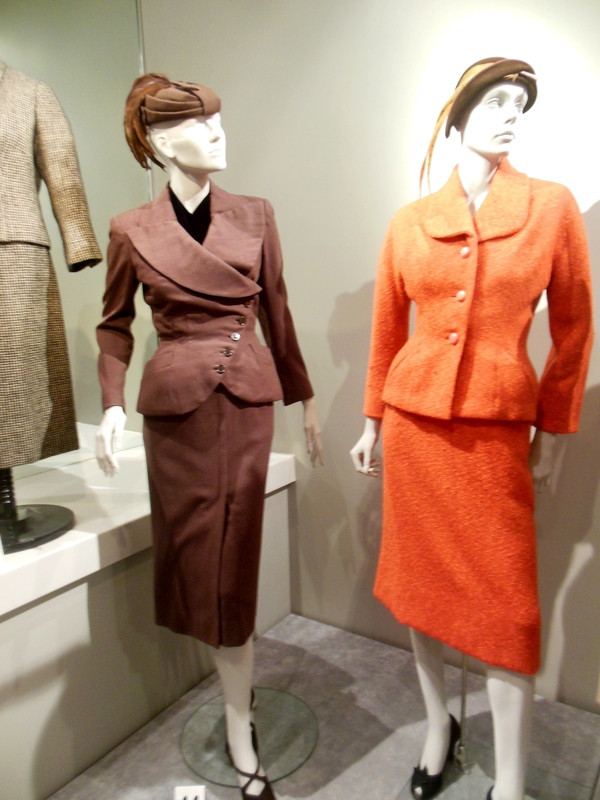 It also highlights Dior suits, with their rounded shoulders, nipped-in waist, padded hips and calf-length pleated skirt. Later, Dior introduced skirts so slim they needed the “Dior Pleat” (a slit backed with a panel of fabric) for walking. Dior in Ohio: 1947-1997 reopens on March 20 and continues through April 28. The Snowden Galleries are on the second floor of the Geraldine Schottenstein Wing of Campbell Hall on the Ohio State University’s main campus. For more on Christian Dior, read Dior in Vogue, by Brigid Keenan; Dior: The Legendary Images: Great Photographers and Dior, edited by Florence Müller; Christian Dior: The Man Who Made the World Look New, by Marie-France Pochna; and Girl in Dior, a graphic novel by Annie Goetzinger. 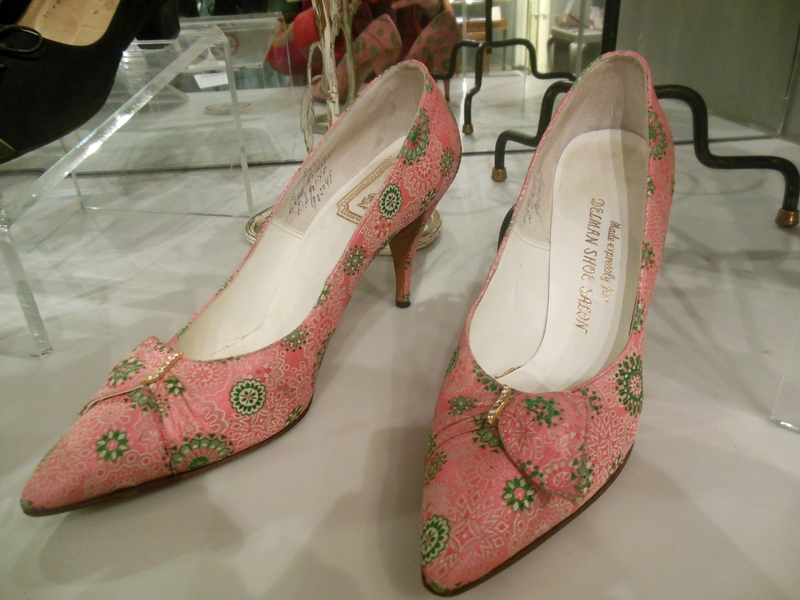 This entry was posted in Fashion, Museums, Ohio State University. Bookmark the permalink.